Musings of my life as an Artist. In my continuing series of Studio Glimpses, I love to respond to questions by my collectors. The process of how I created this painting is generally one of those most frequently asked. In this video, I begin by showing you the photo of a flowering hibiscus from my own garden which was the inspiration for this artwork. Here I write my thought process behind the stages visualized in the video. In my initial stage I work out the composition of the final art work and deciding whether it will be a square or a rectangle. To work out the details of lights and darks that will be in the final painting I like to start with a tonal drawing. Using an HB weight graphite pencil I use my customary swirling strokes to give form to the drawing. Not being partial to outlines I don’t emphasize them but soften the edges by merging them slightly with strokes. In order to transfer the drawing to the canvas I used a mapped grid system. In this case, I put a transparent sheet of paper over the tonal drawing on which I’ve drawn a grid. After measuring the same grid on the canvas I was able to upsize the drawing onto the canvas. Using pastels I created an underdrawing of a neutral ochre color using the tonal drawing as my model, followed by a layer of neutral ochre oil paint which seals the surface of the gessoed canvas. In the next stage, I applied thin coats of oil paints in layers recreating the original composition in the base colors allowing the underpainting to peak through. Many, many layers of thin glazes are applied to give dimension and form to the final painting. Details are added during the later stages, I think of it as putting jewelry on after you get dressed to go to a party. You save the best for last. Each day after if finish working on a painting in my studio I photograph it for reference and view the images on my computer to see the progress and decide if I want to make any changes along the way. I prefer to work on thick gallery wrapped canvas and finish the work off with neutral floating frames. I aim for simplicity in form with exuberance and abundance in surface color. This painting has no visible brushstrokes which is also my preferred style of painting. “Here I Am – Candy Wind Hibiscus” 20×20″ GW oil painting on canvas. $1,950.00. For information about this original oil painting please Contact me directly. I’m glad you came here so I can share my art with you. Each person brings their own history, interpretation and emotion to a work of art. My art isn’t complete without you. Thank you for being here. I love being an Artist! All of my paintings start with the garden, mine or other gardens. On a trip one spring day in May as I wandered around the peony displays at the New York Botanical Garden, with my phone I took snapshots of many of the unbelievable peonies in their collection in full bloom. Later that year on a cold winter day in December, sifting through my stash of photos, a particular pink peony image jumped out at me and demanded my attention. I knew we could develop a relationship together. It often takes months to complete a painting so I really have to love my subjects in order to spend that much time with them. We need to love each other. Once deciding on the size of the canvas I want to use I sketch, using vine charcoal, to give the general outline of the final layout onto canvas prepped with multiple layers of gesso. Then I block in the areas of color, working on my lights and darks. Then I paint using many layers of thin glazing in order to get the vibrancy of color I crave. Oil paints need a few days of drying times between layers and some of my paintings have 15 to 30 layers of glazing. In order to continue painting every day, I usually work on multiple paintings at a time. Each one a different day. A different palette of colors. A different stage of completion. I like the continuous challenge of picking up where I left off. I keep extensive notes at the end of each day for each painting. A sort of diary of each work. I paint quite slowly and quite neatly. I don’t like to feel sticky so I’m cleaning brushes and washing my hands constantly. Gloves don’t work for me since I don’t like the barrier they put between my brush and my hand. Rolls of paper towels help with the tidiness of my style of workflow. In fact & have two different brands for two different uses. I listen to music while I paint. During the duration of this particular painting, I was listening to many CDs of van Morrison music. I don’t know why. I just was. Sometimes I’m in a classic rock groove for weeks on end and other times might be jazz, classical or even new wave relaxation. I don’t plan it. It just happens. I usually paint with just brushes, fan brushes in fact, but the center of this painting demanded a palette knife. It’s not something I usually turn to but since the painting had a mind of its own I complied. Glad I did since the center of this painting is rich with texture while the petals are completely without texture but rich in nuance. I named this painting Centering – Pink Peony. The reason is that it represents two different views for me. I can see with my eyes that it’s an interpretation of a pink peony but in my soul I found it centered me. Made me contemplate the meaning of this painting, this flower, this world it had lived in and now lives in again but in a different way. One ephemeral, one eternal. For decades I have been creating art in circles surrounded by squared edges. When I first made this type of work it was in the mid-1970’s. The circle was most often represented by an apple inside a square or cube. At that time it represented to me the yin and yang, female and male complements to our lives and our characters. The apple was an Eve figure, soft, female, curious, playful and seductive. The boxes were the rules, the male, the limitations, the protection and the containment of her attributes. I have recently returned to this theme but using flowers from my garden as the subjects rather than apples. It feels so calming to me when I create these voluptuous rounded floral paintings. This peony was the first in a series of exploring again the circle in a square imagery so I named it “Centering” because that is how I feel towards these works. I find my centering in two places, in my studio and in my garden. They completely complement each other, one provided by nature and one in interpreting that vision. There is a difference between the imagery of then and now. 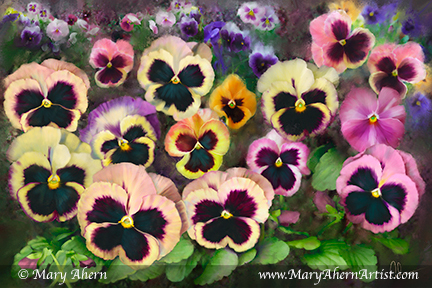 These flowers, though they are encompassed in a square format canvas, they are not contained. They are bursting through the limitations of frame, of edges, of inhibition. They are positive and empowered by their form and by their explosive color. They are neither shy nor retiring. They declare themselves as having established their own space. They are declaring themselves as individuals. “Centering – Pink Peony” 36×36″ GW. Oil on Canvas. Original painting by Mary Ahern. To purchase or for additional information please contact the artist here. Although my stretched store-bought cotton canvas is already prepared with gesso, I add 3 more layers with a light sanding in between each. This makes the canvas less absorbent in my opinion. Everyone has their own recipe and this is mine. I apply the gesso with a roller if the canvas is big or a large brush if it is smaller. Once the gesso is dry, which is within the hour of the last coating, I use vine charcoal to outline my composition. Because the charcoal is rather dusty, I blow the excess off using either my breath or an aerosol can of dust remover depending on the size of the canvas. Next, I then use a thin wash of burnt umber paint and a thinner medium to cover the rough charcoal drawing and begin the shading process. This also fixes the drawing to the canvas & prevents the charcoal from blending further. That layer will dry, depending on the medium you choose, in an hour or a day. I then begin another coat of underpainting using either a warm or cool brown or gray base color. This can either be considered an underpainting or if more detailed and finished it would be called a grisaille. Over an underpainting, I would paint using opaque pigments and over a grisaille, I would be using transparent pigments for glazing. Once this is dry in 1-4 days depending on the mediums used, I then begin painting with color. This is the very classical beginning to an oil painting that I was taught by my professors during my college years in another place and another time. I’ve always been glad that I was able to receive a formal Art education and it has been the basis of all my work over the years. The headlines herald the 25th Birthday of the introduction of Photoshop, the photo editing software that almost everyone has heard about and many have used. Photoshop was released on Thursday February 19, 1990, 25 years ago. I, however, began painting electronically years earlier on the Chyron Chameleon Paint System. 1986 Mary Ahern working on the Chyron Chameleon at the Cablevision studios in Woodbury NY. The Chameleon was a digital painting & editing system complete with dedicated hardware & software aimed at the Broadcast TV & production industry.. Primitive by our current standards but tremendously advanced at that time in the mid-1980’s. In order to sell a paint system in the ‘80’s, since no one really understood the enormous creative possibilities of computer painting, I did demonstrations & lectures in order to sell this tremendously creative tool. It offered drawing tools & brushes, cut & paste, zoom, a removable hard drive, video outputs and 8 bits of color. I have made a very good living using Photoshop, amongst other digital imaging programs, but I was able to apply my Artist’s vision first using the tablet & stylus of the Chameleon. So I wish Photoshop a very Happy 25th Birthday but they are the young kid on the block. I have been digitally painting for 30 years. The aspect ratio of a painting is the relationship between the height and width of the finished piece. In painting the most common aspect ratio has been 3:4. Dancing Iris Trio. Mixed Media Painting available in 30×40″ and 18×24″, Standard or Gallery Wrapped. This means that for every 3 inches in the horizontal/vertical, there would be 4 inches in the other direction. An example would be a 30” by 40” painting. By reducing the size but maintaining the same 3:4 aspect ratio relationship you would have an18x24”, 12×16” or a 9×12” painting. The aspect ratio remains the same regardless of whether an art work is hung in a horizontal or vertical direction. This 4:3 aspect ratio is visually comfortable for most viewers and replicates the standard television format that was used until recently. With the advent of HD TV, the standards have changed to a longer screen and a 16:9 ratio is now the flat screen TV norm. This changes the shape or aspect ratio of the rectangle that is viewed by most people on a regular basis. This change in aspect ratio is also reflected in digital photography and in paintings. This new TV standard has increased the popularity of the longer 2:3 ratio. The new sizes in paintings would represent: 8×12”, 12×18”, 16×24”, 20×30”, 24×36”, 28×42” and 30×45”. Framers use these standard sizes for many of their ready-made frames which is a cost saving to the Art Collector. Studying Art History seeps into your memory. Countless visits to the many museums and galleries that New York City has to offer has crept into my subconscious. This lifelong study has taken me through so many happy surprises as well as quite a number of dead ends. Often Artists are asked who their influences have been for their Art style. Trust me, never would I have answered Matisse. I’ve never appreciated his sketchy use of paint, his lack of detail and apparent lack of a “finished” quality to his work. And then, when I least expected it, I reimagined Matisse’s iconic painting, “The Dance”. Using flowers from my own garden, I picked up the exuberant rhythm that makes his work such a delight. This work is so light, buoyant and a wonderful interpretation of what spring means to me. 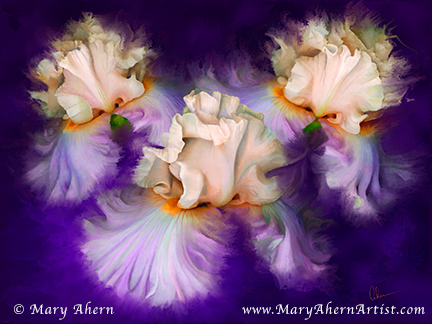 As I was creating the composition of Irises I remember somewhere, behind my eyes, trying to make the circular floating connections of the frilly irises that was suspended somewhere in my memory. I have stood so often in front of the Matisse painting at the Museum of Modern Art, loving the composition while not liking the paint quality. I’ve returned so often to view that painting in the original hoping to find what I missed. My paintings actually start in my garden. This is where I grow the flowers, shrubs and trees, which are a part of the workflow of my creative output. The sun and shade play a role in all my compositions. I actually consider the creative work to be seamless whether at work in the garden or at work in my studios. The up close and personal view of the flowers when I’m weeding, deadheading, trimming and tending allow me the time to become intimately aware of each flower’s details. This is something I like to convey in my work. These light blue irises came to dance in the breezes in the front garden, which I can see through the French doors in my living room. Though short lived, their ephemeral character is part of the fun of capturing them in my Art. Phlox stolonifera, ‘Sherwood Purple’ in front of a Karume azalea in the woodland walks. The composition of this painting was created using elements from different areas of my garden. The woodland walks with their large hemlock trunks for the vertical accents, which mimic the verticals of the irises. The rare spots of sunshine in the front garden, which hold the irises and many other perennial sun lovers, give me many sources of inspiration during the seasons. Light Blue Iris in the Garden. Mixed Media Painting. 30×40″ Gallery Wrapped. © Mary Ahern. The finished painting is called “Light Blue Iris in the Garden”. I’m not very original on names but it is an apt description. One of the methods I use to visualize my Art is to take snapshots of my models and modify them on my computer. Since I’m not a photographer I only have a small point and shoot camera that I use to take photos in my garden or in my studio. I import these snapshots onto my computer and using Photoshop I delete the backgrounds, modify the colors and otherwise play around with the image. I print the images from my Epson printers onto matte cardstock papers. In this particular Art work, after making a completed tonal drawing which I discussed in my previous post, I traced the outline of the tulip onto 300lb hot press paper using a lightbox and a 2H pencil. Then, using Winsor Newton watercolors, I put down my first layer of paint. Once dry I used my set of Prismacolor colored pencils to draw over the watercolor. For some reason I find this process to be very relaxing and meditative for me. If I need some calmness in my life, I can go to my studio at any time and pick up right where I left off. No fuss, no muss, no bother. There are so many ways to create paintings. As an Artist who has been creating for over 35 years I have developed a variety of methods to arrive at my finished work. Sometimes it is interesting to get a peek behind the process, so here is one style I enjoy. Since I’m not a photographer, I take snapshot of flowers I either buy or grow. I usually select them for color or just for form. I find myself attracted to large bold shapes rather than the more frilly inflorescences. I then decide what mediums I will work in and whether there will be one finished Art work in one or more mediums or whether the work will be part of a series. I love creating tonal drawings so I often do a finished piece in graphite before I start a painting just because I like the feel of drawing. It also is a great way to work out values of highlights and shading. If the work is part of a series, I need to imagine the size of each piece and the total overall impression I’m looking for. This ups the level of complexity considerably and actually makes for quite a nice challenge to my visual imagination and my technical consistency. For a series of work I need to choose the size of each work and the size of the overall series. I also need to create a composition that stands alone as well as works for the series. My work must not only be accomplished to my own standards for each piece but it must be consistent across all the work. This can be tricky if you don’t create all the work during the same or close to the same period of time. The North Shoreian has just published their April Home and Garden issue with my “Single Yellow Daffodil” on the front cover. A delightful article about my work is featured inside this publication which is a magazine covering the North Shore (of Long Island) Arts, Culture & Politics. If you’d like to read the whole article please click here and visit the Press section of my website. If you’d like to see an online version of The North Shoreian magazine please click here. Classically trained painter, and Northport native, Mary Ahern, has spent the past twenty-five years studying and mastering digital painting and design. Mary’s interest in digital painting was stimulated when she was working for a company that created graphic technology for use in the television and production industry. Beginning as a salesperson in the early 1980’s, Mary began learning about the newest advances in this medium. As technology progressed, these high-tech digital systems became a practical expense for the small business owner and were readily available. In the early 1990’s, Mary invested in her own system and created her own graphic design company, Online Design. Her company was 100% digital which was unique at a time when paste-ups and mechanicals were still the norm in graphics. Mary’s abilities as an artist are not limited to digital painting. As a traditional painter, Mary is very talented. Mary mixes mediums, such as watercolor, oil paints, pastels, colored pencils and graphite, to create her works of art. She has been doing traditional painting and drawing for over thirty years and her work reflects many hours of time and commitment to the art. In addition to art, Mary is very devoted to growing a private garden. She spends many hours cultivating the soil, planting, pruning and nurturing her flowers. Not surprisingly either, she adds a degree in Ornamental Horticulture to her already impressive resume. My Garden and my Art work side by side. Both require me to make aesthetic judgements about composition, scale, color, texture and style. When I’m deciding where to plant the flowers I’ve hauled home on my endless trips to the nurseries it doesn’t seem that much different to me then when I’m deciding how to compose them on a two dimensional surface. I think about what style I’m looking for, what colors will work together, whether the scale of the placement works for me. I think about the type of flower and texture of the leaves. I make decisions about the 3D composition of the garden much like the 2D composition decisions on a painting. The garden adds so many additional layers of complexity since the artwork is moving in time with nature, the seasons, the elements, and time. The painting remains caught in a moment. Capturing that ephemeral moment is so gratifying to me in my Fine Art. I control it, unlike my Garden which is usually out of control. You can visit this Watercolor painting on my website in The Work or you can buy a print of it in The Store. I have a number of varieties of White Daffodils growing in my garden but I don’t feel that I ever have enough. Since I am over run by squirrels I try to focus away from crocus and my beloved tulips. (After all, both my parents were born in Holland!) Squirrels consider the bulbs as an entrée and the flowers, if they arrive, as delectable garnish but they leave my daffodils alone. The abundant shade in my garden causes challenges to many of my daffodil plantings but I still crave the color in early spring. One of the fun parts of designing gardens is figuring out how to hide the declining leaves on the daffodils as they absorb the chlorophyll for next year’s growth. I’ve been known to hide them using daylilies, Siberian iris and ornamental grasses. I’ve stopped braiding the leaves since it seems so demeaning to their dignity. I created a Digital Mixed Media Painting from one of these white daffodils. I love the way daffodil leaves have a slight twist to them. One of things I kept in mind when composing the piece is that the stem is offset where it enters the back of the flower, unlike a tulip which is a straight up vertical. Another issue is making sure that I paint the shadows different from when the “light” hits the round stem vs. when it hits a flat leaf. You can see this Single White Daffodil in my Store. I created various sizes for purchase. I think it has a rather heroic feel to the composition. During my freshman year in the York College, Fine Arts Program in 1975 I took a class in Two Dimensional Design. First we studied the rudiments of rhythm, and then we abstracted the underlying design elements of images. The third project was an introduction to color. We used acrylic paint to make color charts of both warm and cool gray scales. It took a great deal of trial and error to get even steps from white to black and back down the scale again. As a former musician, I used to play my trumpet scales by the hour, much to the chagrin of my family. Trying to get the color scales right in paint is much the same experience, only quieter. Another part of this Design project had to do with creating these scales in Color. These color scales were placed against various colored backgrounds to demonstrate how different the same colors appeared when imposed on competing ambient hues. These simple exercises introduced me into the world of luminance, saturation and hue, the basic platform of all painters and colorists. Having explored rhythm in the first classes in my two dimensional design class in my freshman year in college, we then moved on to visualizing abstraction. I had to find an advertising in a major magazine, select a portion of the image and analyze why the composition worked. Then I had to take a one-inch section of the ad and reproduce it in acrylic paint. This first piece was from an ad for scotch, I believe it was a bottle of Pinch. This abstract includes the side of the bottle and the half filled glass with ice behind it. The curves of the glass and bottle worked very well together and the slight color shift of the liquid in the glass unites the scene. I remember painting this with a brush the size of an eyeliner. The finished piece is about 12″ square. I’m very patient with my work. I remember less about creating this abstracted landscape. I do know that it is a landscape scene from the southwestern United States and includes the long horizon lines and massive skies of this part of the country. Have you missed some of my Events, Lectures and Shows? Why not sign up for my newsletter and be the first on your block to get the latest and greatest News about my upcoming new work, Art Shows and lectures. Plus you will receive a free downloadable Art Book with my latest work, motivations & influences for you to keep! Like you, I respect my privacy, so I don't share any of your info anywhere, anytime! I Promise!